One of the most painful things to go through life is to be the target of bullying, the act of using superior strength and intimidation to force a person against their will and humiliate them. Everyone has their own demons to deal with, however, bullying is a serious issue that is one of the causes of irreversible trauma amongst other worst things. If you’ve ever been bullied or going through it right now, you may have already asked yourself countless of times what you did to deserve this cruel treatment- the answer is that you are innocent of any wrongdoings. No one deserves to be bullied and bullies are often sufferers from deep psychological problems that they have trouble dealing with, hence, they vent their anger to people that seemed defenseless to them. The victim holds no blame in bullying, you didn’t ask to get for it and you don’t deserve it. Don’t ever think that it’s because you lack certain qualities or abilities that’s why you’re the target of bullies- that’s completely false. Even big hollywood stars like Demi Lovato had her own fair share of bullying throughout high school because she was apparently an easy target. Lovato is an active supporter of the STOMP Out Bullying, a national anti-bullying and cyberbullying program for kids and teens, is a signature program of Love Our Children USA, the national nonprofit leader in fighting violence against children since 1999. Bullies often target people that they feel ultimately jealous of, they want what they can’t have. One of the best ways to combat bullying is to reinforce your self-esteem that you are loved by many and have a strong support system. Understand that you have a life worth living and that if someone has a problem with that then they’re wasting their own life by spending it showing their insecurities through shameful displays of violence and intimidation. 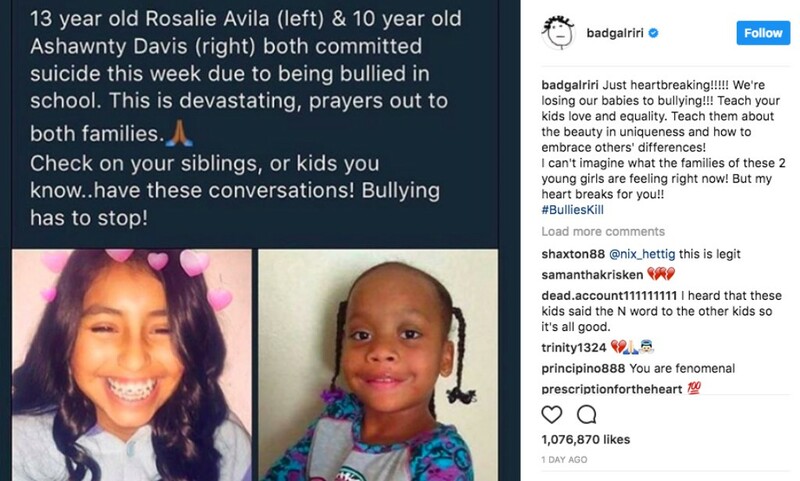 Even Queen Rihanna went through bullying because she wasn’t “dark enough” but she never gave up and the legendary music icon is now an active protester against bullying. It’s not always the wisest choice to put on a brave face when asked if something is wrong when really you feel like crying and hiding from the world. Don’t keep your problems and emotions bottled up because a boiling kettle is bound to explode sooner rather than later. Talk to a counselor or a trusted teacher if you feel shy talking to family and friends, talking about it will help release the pent-up tension and really take the first step to solving the problem. Celebrity mom and acclaimed actress Hilary Duff is certainly not one to back down even from “mom bullying”. Duff knows that you can’t fight back if you don’t make your voice known and the proud mom has proven to the world just how tough she is. Never think that you’re powerless against your bully or when you see something being bullied, everyone can be their own superhero. Bullies put up a strong front when in reality their one of the most vulnerable people on earth, when you show that you’re no longer afraid and stand up for yourself- then change has begun with that strong act of bravery. Bullies pick their victims because they rarely fight back and when they do their resolve to continue bullying waver and their ego deflates because they no longer strike fear and intimidation like they want to. One of the most well known celebrity that have made their voice known for their stand against bullying is Lady Gaga, who was slutshamed and heavily bullied in the past and since then have launched the Born This Way Foundation to fight against bullying and help victims recover. There is strength in numbers and bullying isn’t something that can be beaten down in a day it, you’re not the only one going through bullying and the odds are you’re never going to be the last. It takes a community to make a big change and spread valuable awareness on the topic and get people to really understand the root cause and harmful effects of bullying. Together we stand to make a difference for a better tomorrow that is free from bullying.